UEFA has charged AEK Athens and Ajax after clashes between fans marred their Champions League match on Tuesday. There were ugly scenes before kick-off in Athens as home fans were pictured throwing flares and other missiles into the away section of the Olympic Stadium, with some images showing flames erupting on the terrace. Riot police were also seen striking Ajax fans, some of whom were left with bloodied faces. UEFA confirmed on Wednesday that both clubs have been charged with throwing of objects and setting off of fireworks. AEK also face charges of field invasion by supporters, crowd disturbances, insufficient organisation, displaying an illicit banner and blocking stairways. The case will be heard by UEFA's Control, Ethics and Disciplinary Body on December 13. 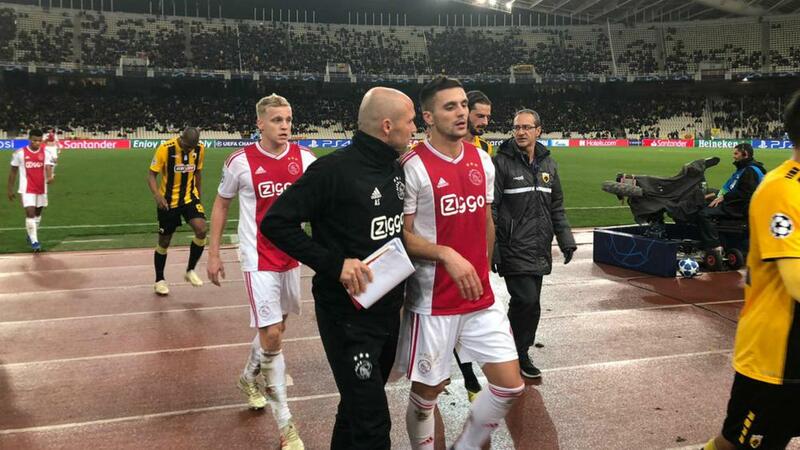 Ajax claimed a 2-0 victory to book their place in the last 16 and leave AEK facing elimination from European competition this season.